This work began a decade ago. It’s a sustained study of light and texture. Huge panel painting designed for serious art collectors. Email me for video and a virtual tour. If you look closely you can see spring board cuts visible on the old cedar stump, meaning that this giant tree was logged by hand. Typically, loggers would cut a wedge out of the stump and insert a board to stand on. Subtle burn marks also show that this stump survived a massive forest fire that swept through the valley. This stump is about 50 feet from my studio. 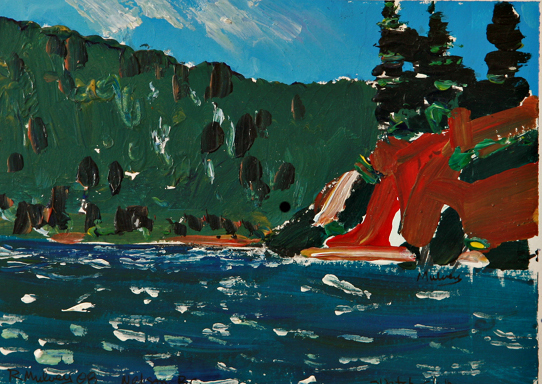 Outdoor painting near Sooke, Vancouver Island. Began as a little ink sketch and then finished in the studio. Bright colours that sharpen with a simple black frame. Good for living rooms, offices, or a bedroom. Windy day on Kootenay Lake B.C. I pushed the red hue to the ‘max’. January 14,1995, was a very cold day in the Slocan Valley. I headed out with a large panelboard and set to work capturing this frost laden landscape. The paint froze within seconds of application but I kept dashing down the impressions of colour, light, and form. I headed home after thirty freezing minutes.The painting started to melt and change appearance once in the house. The top right mountain held it’s own and I used that section to steer my course for the rest of the picture. Going to the edge will always give weight and magic to your creative effort. Comfort is the fuel for mediocrity. Spring is very welcome in the mountains. The birds return and the landscape starts to change. This is what it looks like in March as the air warms up and the first ‘sugar’ snow appears. Many Galleries with a physical address really do work hard at generating sales for their artists and for themselves. Some Online Galleries link to Physical Galleries and really do work hard at generating sales for their artists and for themselves. Many Artists who operate their own Online Gallery really work ‘very’ hard at generating sales for themselves. Physical galleries charge a 50% commission for two dimensional art (paintings). they charge 30% to 40% for three dimensional art and photographs. This is a fairly standard commission rate across the board. When a gallery takes on an artist they price for profit. Wall space and floor space is real-estate. Prices have to pay for their space and generate income for the artist and the gallery! Worth is determined by how many works are selling. Prices are adjusted yearly in an upward direction if sales are consistent … artists are dropped if their sales do not generate profit. It’s a fair market plan that has a bottom line: No sales means no commission! The Pricing Game For the Physical Gallery is a real game with rules and procedures. To be a player you have to play by the rules and there will be no whimpering and whining if you feel you are losing as the artist involved. Here are the basic rules of engagement that the artist must comply to if they are to be represented by a physical gallery as well as the rules for clients purchasing a piece of art. A consistent ‘style’ in an artists work sells better than a ‘style’ that is developing or changing. The artist’s work must be recognizable as their own or of a popular genre. Standard sizes are easier to price and frame. Most pricing is calculated by the square inch which makes ‘size’ and not ‘preference’ the bottom line for worth. The Mona Lisa is 30 in. by 20 in. An expensive piece of real-estate even if it’s just a little piece of property. The Game runs smoothly when pricing has no sentiment or preference .. just size. Lots to look at and lots to choose from. Inventory needs storage and storage is real-estate,which has to be paid for. A typical physical gallery will have a few paintings on display for each artist they are representing and the back room will carry the bulk of the inventory. They also will have a virtual gallery that can display their artists right in the physical gallery if additional work is to be seen that they don’t have on hand. The most important rule in the price game is that the gallery representatives are the rule setters and the major players. Sales are generated by their knowledge and expertise. Consumers listen to the sales representative and in most cases are directed to a choice that will fit their understanding of what is good and fine in the work they purchase. It is easier to trust someone else when purchasing art than to trust yourself, given most people’s limited knowledge on the subject of art. After all, that is why you visit several physical galleries … to find someone you can trust and let them lead you to a safe and satisfying purchase. Older established artists are easier to sell than mid career or new artists and the prices are always higher for the former. It’s a simple fact and rule of marketing; Cut off the supply and the demand is greater … and the price escalates. Canadian painter, Emily Carr died in 1945. Heffel’s Online Auction sold Carr’s, “The Crazy Stair” (the Crooked Staircase) 43 3/8 x 26in circa 1928 – 30, for $3,393,000. I know that Emily got very little per square inch for her efforts 84 years ago. This is the Hidden Rule – The art that is rejected becomes the cornerstone of commerce. The Pricing Game For Online ‘Virtual’ Galleries is taking shape and in some cases is taking it’s lion’s share and establishing a set of ‘new rules’. One example is that it is not wise to charge less for art sold online than for what it would be sold for in a physical gallery. That would be against the ‘new rules’ that are being established worldwide with the advances in technology and consumer confidence for online art sales. Let’s take a look at some of the new rules. Original and creative art is allowed to be represented by the online market. The old rule of ‘conformity and ‘sellable style’ is not as important as personal artistic growth and experimentation beyond the borders of conformity. That is the new horizon that is in front of us as creative people. Of course you will find the same old, same old on many sites, as is the case in physical galleries also. The potential of online art sales is definitely being carefully considered by those adhering to the old rules. The guiding rule of online success is ‘Educate, Educate. and Educate. Answering the questions that clients need answering is the single most important function of an online gallery. Most of the answers should be provided within the online gallery setting with clear visuals, up front pricing, and a substantial amount of text that addresses the issues at hand when purchasing online. Videos of the artwork and the artist at work build the client / artist relationship, providing a personal interest in the material that is being presented. Viewing countless ‘stills of paintings’ is not a pleasant or productive experience. The average time spent looking at a piece of art is 6 seconds in an art gallery. Knowing where the art has come from and understanding what the artist is presenting will encourage more looking instead of clicking to the next image. The virtual gallery is a self directed tour. Relax and enjoy the the artwork stress free, with no interuptions or interference. See what the artist sees. Choose your favorites and feel some wonder. It’s art. Its meant to be enjoyed. Online art sales must be delivered on time, with return options and insurance in place. Shipping should be free. The final service rule is the availability of personal contact with the artist or their representative. Artists are allowed to value and sell their own work. This is actually an old rule that is coming back as Claude Monet,1840-1926, prime mover of the Impressionists, sold out of his home when few dealers would represent him. I believe he would have had a virtual gallery that would have provided him with a steady income from painting, especially during his mid-career when he sold paintings to buy more materials. The ‘Hype of Fame’ and the ‘Hall of Shame’ have no place in the ‘Virtual Gallery’. We are here to create art, sell it. and create some more -not to play the get rich and famous game. ‘Unknowing experts’ have invariably chosen the wrong horse to win in the ‘Gallery Game’. Auction houses are full of ‘rejected cornerstones’ that didn’t suit popular taste and now are selling in the millions. Worldwide auction sales are now in the ‘Billions” Steady income … steady work … steady progress…this is what we as committed artists are looking for and this is the rule of industry that we are starting to live by. Responsibility Rule – Support an artist and feed a culture. Art reflects change. Art develops culture. Art educates. Art inspires ingenuity and invention. Art moves us inside and out. Don’t ‘rule’ out art from your life … bring it into your home and let it do all of the above and more. A quiet spot by the bend of the ‘Little Slocan’. October colours saturate the Landscape with golds and violets. The Slocan River swells to near epic proportions in early April and I feel I am back on the West Coast in a tidal landscape. An early morning sketch in the Spring is a tonic for life. This is the Bird Sanctuary along the Slocan River about 45 minutes from home. We get there by mountain bike along the Slocan Rail Trail. Pinch me … it’s too beautiful and I’m getting spoiled. Watercolour on 140lb. cold pressed arches paper. 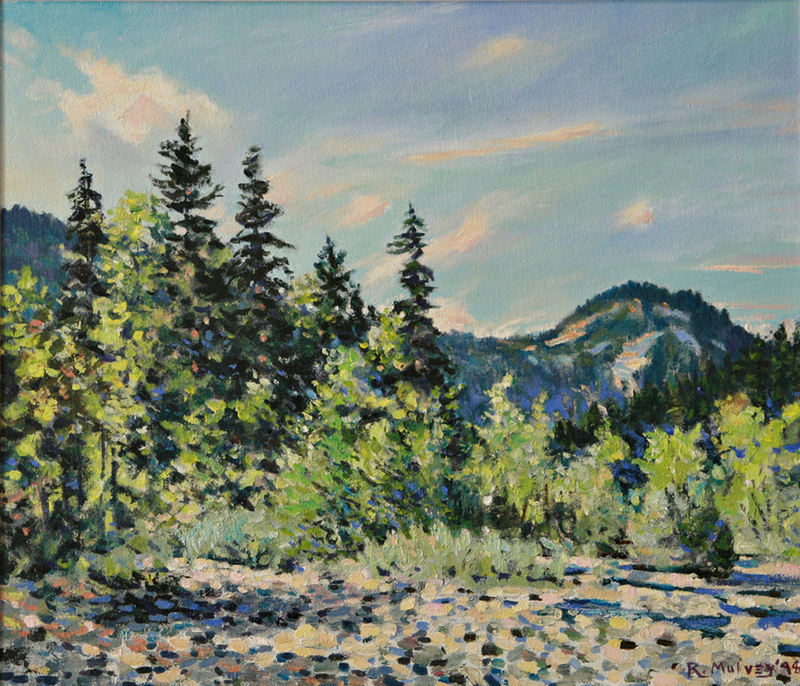 The confluence of the Little Slocan and Slocan Rivers is a magical spot where I sketch through every season.There is an enormous bench along the Rail Trail that you can perch on and feel invincible as you wield your brush at the majestic landscape before you. 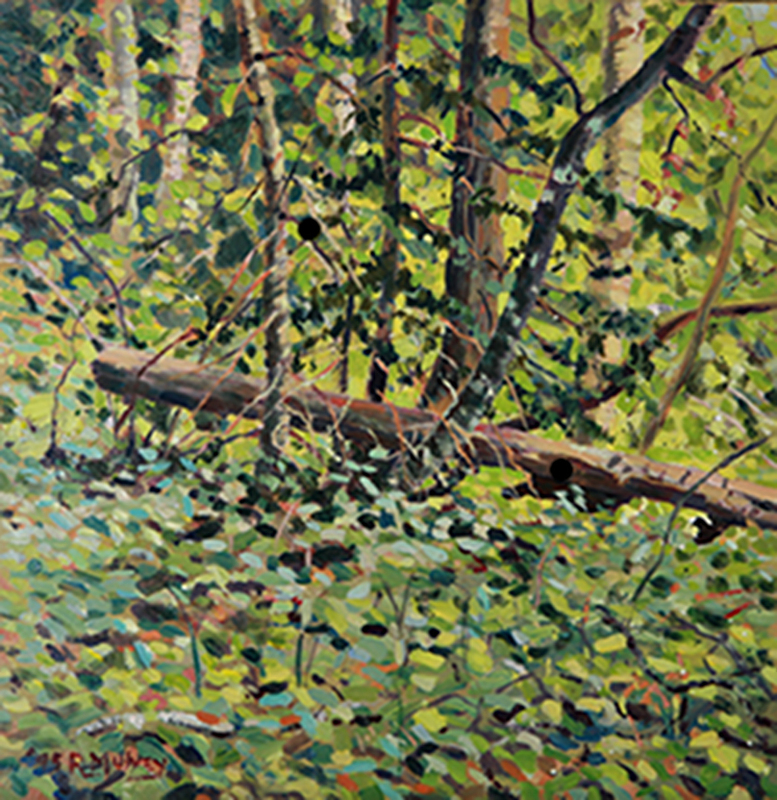 Each painting of this scene is unique as the mood and colours are always changing with the seasons. Whoosh!!! and he was gone. 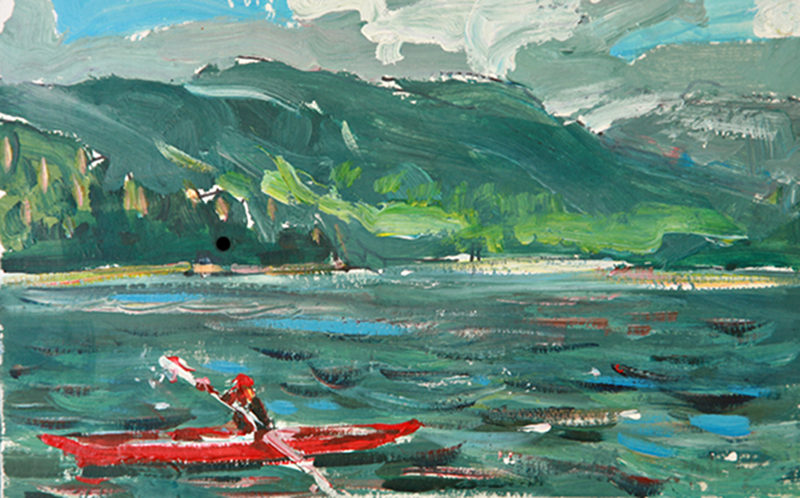 You do not have time to do anything but react to a swiftly gliding Kayaker cutting through the pristine waters of Kootenay Lake on a cool summer morning. Take a look at the water dripping from the right tip of the paddle, the red helmet producing the subtle shadow over the face, and the deft red strokes that complete this sleek little craft. All is dwarfed by a bold ‘slash and dash’ landscape of rolling mountains and sky. Completed outside in 2007. 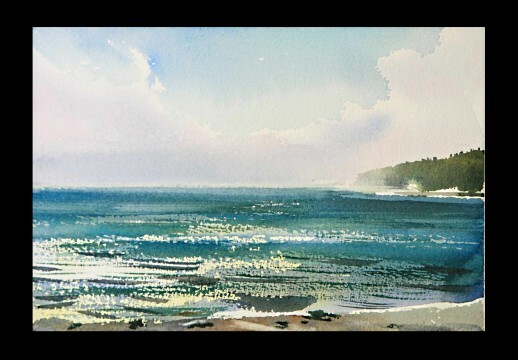 Ink and wash. Sombrio Beach. 8 by 11 inches. Spring has come ... at last! I spent a lot of time painting outside during the 90’s. The kids were growing up and the studio was not a place I could hole up in for hours on end. Happy home, happy artist, meals on time, mortgage paid, food in the fridge, and a host of other obligations to be met…ah the life of an artist. My excursions to the river and forest proved very productive especially in the early morning when most were still asleep. The outdoor paintings of this period were very responsive and natural. I would bring the same picture to a spot at the same time of day for 3 days in succession and finish everything in natural light. At the end of the 90’s I still had about 10 paintings not sold and it was then that I decided to start ‘collecting’ my own art. You can imagine that even 100 days painting outside in a year would produce at least 30 paintings, if each took 3 days to complete. I have continued to collect my own work and ‘hold back’ pieces that could be worked up in the studio to a higher level of ‘polish’ or left as is for future sales. I do not have a barn full of paintings as ‘culling’ is an integral part of an artist’s duty. Quality over quantity is still very very relevant to an artist’s production. How Do You Purchase A $22,000 Painting Online ? Which painting do you think is the $22,000 painting? Image size is crucial to choosing art online. Let’s help you with some more information about these two paintings. Below is a close up of #1 painting. It shows a detail of 1/12th of the painting at about 75% of actual size on my 36 in. wide screen monitor. As you can see more visual information is the key to fitting the right work of art with the right client. Actual size of this Studio Masterwork is 8 ft. by 2 ft. It’s framed to museum standards and is one of my largest works. By now you have guessed that painting#1 is the right choice. An 8 foot by 2 foot Painting is impossible to read on your ‘pocket device’. Driving to our gallery is out of the question if you live on the East Coast and we live on the West Coast. You can view it on your big screen and get a decent impression of it’s appeal to you. Colour calibration on your big screen may give you a mis-read on the colour harmony. What you need is a ‘true image’ of the painting. Here is how we make your purchase satisfying and stress free. The time is almost upon us when 3-d imaging and 360 degree digital zoom cameras will give you all the information you will need to inspect and approve your purchase. A Photographic Print with ‘true colour’ is sent to the prospective buyer which provides for more visual information. A short film with ‘true colour’ is loaded into ‘Ron Mulvey Vimeo’ for viewing by prospective buyer. Details on method of payment and insured shipping are worked out and agreed upon. How much time do I have to purchase a painting that I like before someone else tries to buy it? First come first serve is our policy. Consideration is always given to the ‘time factor’ involved with making a decision. After 30 years of arranging purchases for clients we will put all our experience to work in keeping you informed about making timely decisions in regards to your purchase. A frame protects, displays, isolates, and invites. Consideration #1 Custom framing simply means the frame is assembled by a trained framer. They measure, cut, glue, clamp,assemble,tape, and give it to you ready to hang. Good framers will use acid free materials only! Total cost for let’s say an average 10 in. by 12 in. 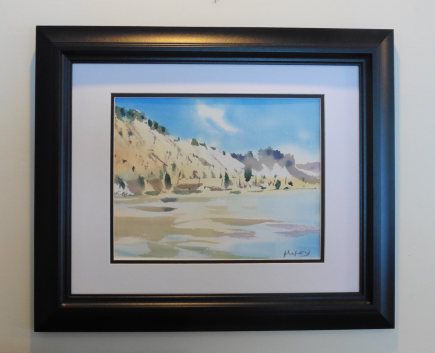 watercolour, including a mat and frame would be from $120 to $250. Now we might pay $150 for a great little sketch and then add $145 for framing. your total would be under $300. If you choose to go with the custom framing you will be assured that all the criteria will be met as stated in the title of this post. Consideration #2 Do it yourself is very economical and will meet the criteria for sound framing. We supply acid free tape, free of charge, with our watercolours and sketches on paper. You have to purchase a small sheet of acid free backing paper at a minimal cost to protect the art work from acid bearing papers in your mat or frame backing. Then you can pick up a ready made frame and mat from your local “out of the box store’ and assemble it yourself at home. Total cost about $25 to $40. Ten minutes on utube will give you all the pointers you will need. I have found that more stores are using acid free mats with their ready made frames. You will still need the acid free backing paper. Caution: Artwork on paper needs a Mat and Glass. Plexiglass ( a little pricey ) is the best as it will not damage the artwork if it falls off your wall. Otherwise hang frames with glass ‘securely’ to the wall. Artwork done on 300 lb. or more paper, using full bodied paints, can be varnished and do well without glass. Why we do not ship our artwork framed ? Glass breaks. Frames are heavy and double shipping rates. You will enjoy picking out your own frame more than settling with one we pick out. You save money. We save time and shipping headaches. Why should you contact us when your ready to buy ? When one of our ‘children’ leave home we do want to know where and to whom they are going. We want everything to go smoothly and have all your questions answered, even if it’s a $40 sketch or drawing. Professional artists keep inventories of where their artwork lives. Many buyers purchase more than once and a friendly professional relationship works to everyone’s benefit. 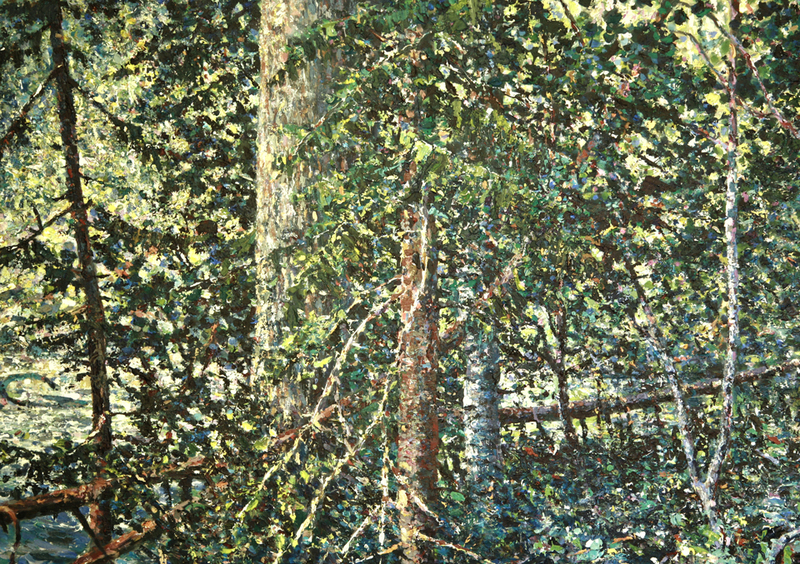 One of my greatest collectors was Don Flood, who left us in 2014, his collection totaled 52 works. His love of all fine art was the mark of his greatness. I was encouraged by his patronage for over a 20 years. This virtual show is dedicated to all true patrons of the arts. 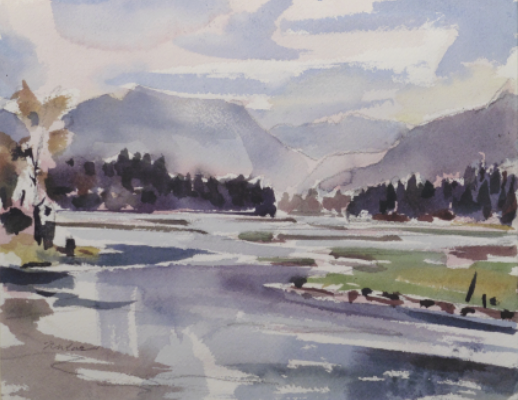 Don Flood Video can be viewed under Thoughts on Landscape Painting. Arranging shipping does need some particulars answered to make it all work smoothly. The safest and most cost efficient means will be chosen depending on where you live. Returns rarely occur but rest assured our policy is 100% satisfaction and no questions asked if a return is needed. Work with us before you purchase and all will go well. Does a high price mean the artwork is great? For myself the answer to this question is easy. A high price means a ‘great’ deal of work went into a painting and this produces the high price. A ‘Studio Masterwork’ is a labour, a struggle, and a joy to complete. Mastering the techniques that are necessary for a sustained effort in the studio do not come easily. The requirements are study, practice, patience, and inspiration. Digging deeply into your ‘whys’ and discovering the ‘hows’ that make it all happen. This all takes time, dedication and purpose. The result is always the best that you can do…and then you move on with a fresh attitude and eager anticipation to the next work. The pricing of ‘major studio works’ is always considerably higher than the work that is done outside, gathering impressions, moods, motifs, forms, and colours from nature to make the outdoor painting. 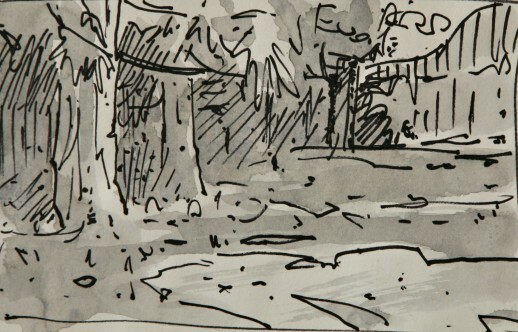 These ‘outdoor sketches’ are the connection with nature that forms a visual and emotional memory for the sustained effort in the studio. Is the work ‘great’? Time and taste will determine the pedigree of greatness. The artist does their best and the price reflects their effort and confidence in the paintings merit. Does a low price mean the artwork is less valuable? 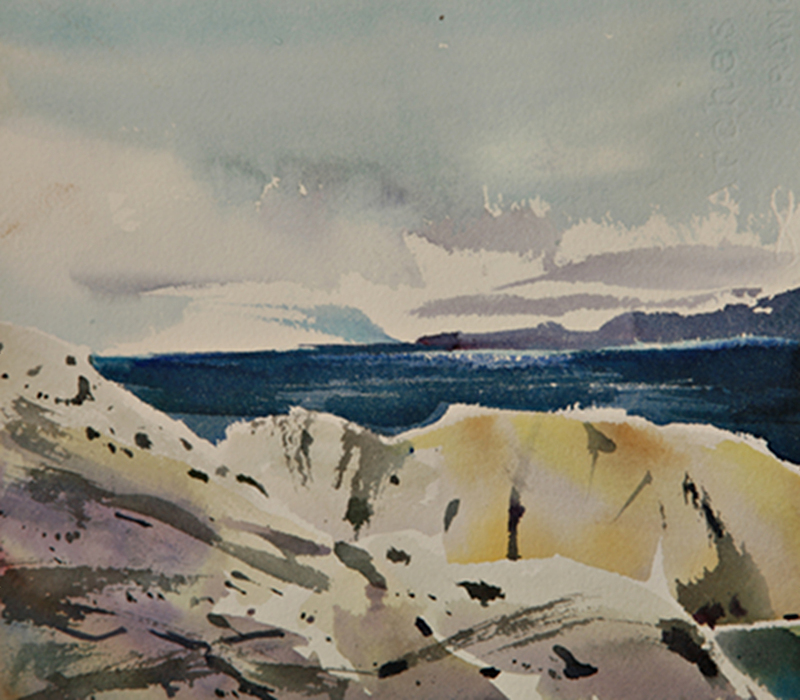 I was setting up to do some ‘search sketches’ on the West Coast of Vancouver Island in 2011, gathering first impressions of a pale violet grey cloud-bank that was rolling in from the east, gazing out and out and out at the dome of nature and then dashing at it with a black pen and finishing with a tonal wash of West Coast greys and blues. 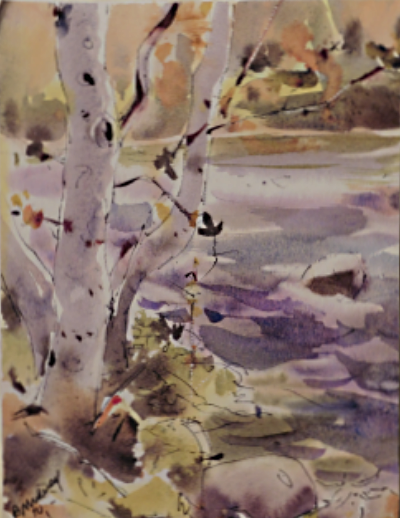 Fifteen minutes later I started a small watercolour of the same scene, having explored the mood and flow of the landscape with my 8 by 10 in. ‘search sketch’. Each drawing is leading to the next painting, be it big or small, it is the culmanation of a process that started with the ‘quick sketch’. Rembrant threw out his brushes. They had no value to him. Many artists stash away drawings and studies. They hold little value for them. Art Dealers and Museums are always looking for these little gems – usually 100 years later. They value them. A low price still can have lot’s of value. If it’s valuable to the artist it will be valuable for you. After all what’s wrong with a little cash for a quick dash. 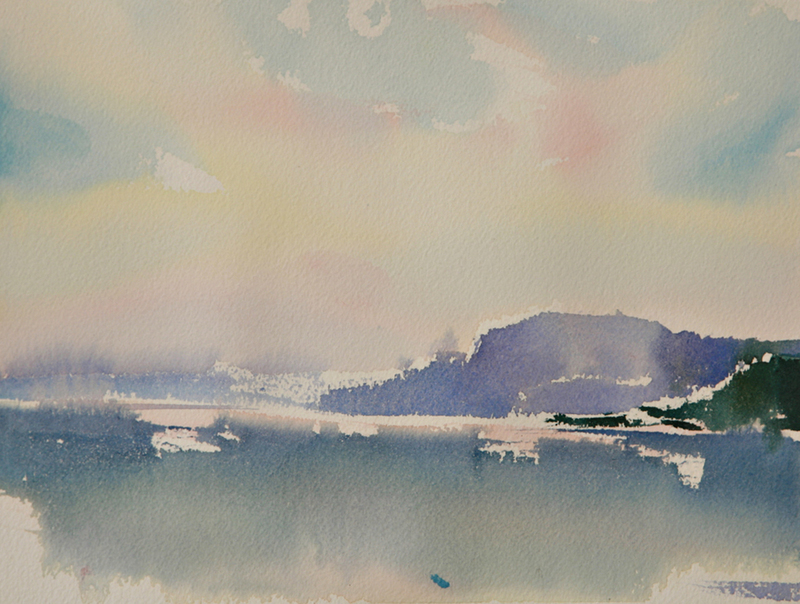 This is a quick searching sketch which opened the door for the following painting in watercolour. I am now working on a large Studio Masterwork ( shown below) based on these two outdoor works. 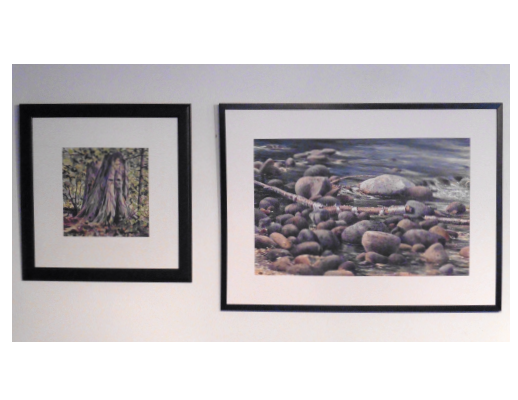 All three works are valued by the artist and all three will be for sale at different prices. Edvard Munch’s iconic painting sold for 119.9 million at auction. Mr. Munch could have used an advance on this sale at the time of it’s painting since it was painted on ‘cardboard’. He didn’t have the resources to purchase a canvas. The artist has to do what they do and many have day jobs to support this inner passion. At times it really does get frustrating and yet we manage to push through and get back at it. Was 119.9 million too much? Hard to answer that one but I believe Edvard Munch could have used some of it! The bottom line should always be the same for every artist. What is the value of this work? Not how much is it worth? For myself, I put the greatest value on my Studio Works. They are my teachers and they tell me where I am going. They instruct me as to what to do next and at times they give me a lot of homework. My next value is for the Outdoor Paintings that capture a certain something that was beyond my expectation or perceived ability … in short a ‘breakthrough’. A selection of these are brought into the studio and developed without losing their ‘freshness’. The others are left as is and say, ” Do not touch me!” The last value is for the quick sketch that keeps the flow of it all going. Even though it is first to be done it is last to be valued. All three ‘value levels’ are worthy of worth. Some more than others . Does the Artist demean their ability with a low price on selected studies,drawings, and quick sketches ? I think it’s fairly obvious that if you are willing to pay $40 for a ‘pseudo print’ why not pay $40 for a genuine piece of art ? As Mr. Munch would advise us, “Sell the little ones and get materials with the money!” Ego Ego where do ‘I’ go. The only shame in a low price is when it’s a shame you didn’t share it for a little cash to someone who wants some real art on their walls and can’t afford the bigger bucks. Be willing to price all your work and have something for everyone … even if it’s just to get them started. 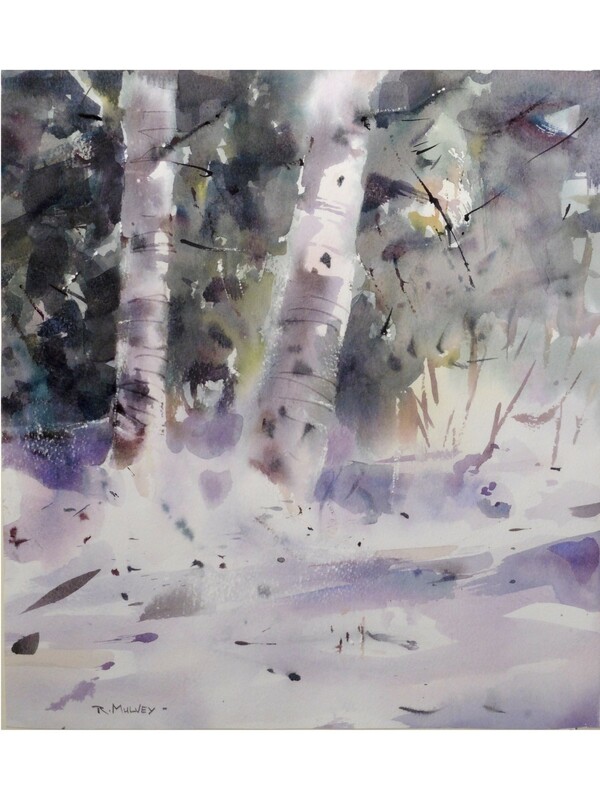 Below is a ‘Detail” shot of the finished painting ‘Broken Birch” from 2012. the above sketch in ink and wash started it all. Completion from start to finish was 3 years. Process is movement over time. Inspiration is a moment of time. Take the first bus and get going …transfers are always available. From sketches to finished Studio Masterwork .. all is a process … all has merit. If someone in 1935 offered to sell you Picasso’s shopping list with a little scribble drawing on the back …at a reasonable price … would you have bought it ??? Pen and grey wash on mat board. A fine little sketch that is ‘reasonably’ priced’. 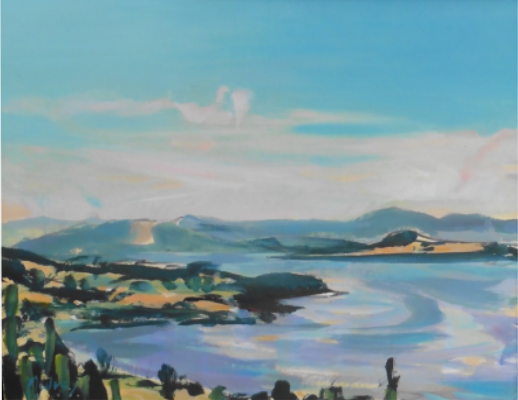 Prices as of 2015-16 will now be posted on individual Sketches, Drawings, Outdoor Paintings, Collectable Paintings, and Studio Masterworks in the’ Virtual Show’of Landscapes by Ron Mulvey. Browse through the website and find what you need to start or add to your collection. Thanks for the time you have spent browsing, looking, and learning about Art on this site. If you want to do some ‘homework’ visit http://www.artbusiness.com/careerspecs.html and you will start to discover a very BIG WORLD … the WORLD OF ART … find out how to get quality art for your money! Soft and glowing is what this time of day is all about. Although there are no strong, vibrant, colours there is a ‘luminous’ quality to the image that captures the lighting on this marshy landscape. Luminous landscape of West Coast evening. 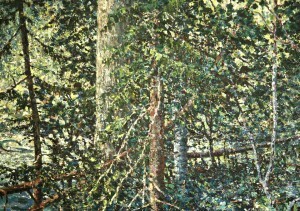 Most of the paintings done in the studio during the 80’s were in a ‘magic realist’ style. The term ‘magic realist’ has changed since then and today has all sorts of meanings and representations. In the 80’s it was a style of painting realism that elevated the ordinary and gave it a ‘magic’, a feeling, a mood, an elevated perception. In my case it was giving the paintings a luminosity that made them glow. Faber Birren’s colour theory was my main course of study at the time and I put his principals of ‘luminosity’ to good use. Early 8o’s ,when puddles were all the rage with young painters. Great reflections and sand texture. Soft West Coast greys and earth tones saturate the landscape of a typical October day at the coast. This is now a collectable work as it has been kept tucked away for over ten years. A painter is always moving towards something new and always exploring new methods. The older pictures are a statement of the fact that they have been ‘on the road’. A little gem that captures a big mood. The Show Is Coming Very Soon / ‘CLICK HERE ‘ FOR THE TRAILERS AND A PREVIEW ! Fast paced intro to the landscapes of Ron Mulvey. A short intro with a selection of landscapes from 1980 to 2015 set to classical music. A short overview of the outdoor sketches, outdoor paintings, and studio masterworks by Ron Mulvey, Set to the classical music of Vivaldi. ‘Think more and paint less” Edgar Whitney had some great sayings and some of them made you squirm…after all isn’t painting all about ‘feeling and responding’? Yes that’s true in some cases but thinking really adds fuel to the ‘feeling’ and brings it to the next level. Try it! This post talks about how to create realistic lighting effects in landscape art. 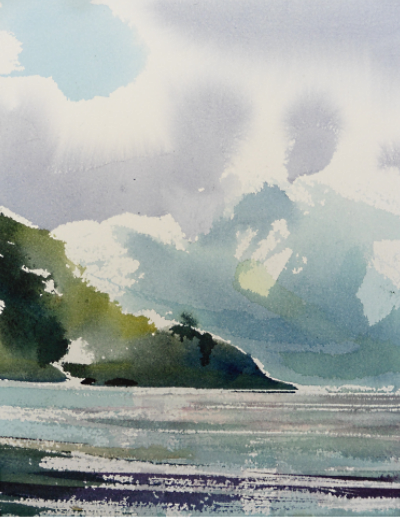 I offer some exercises for artists, as well as discuss the difference between direct observation of light and the different colour effects needed to recreate that experience of light in art. 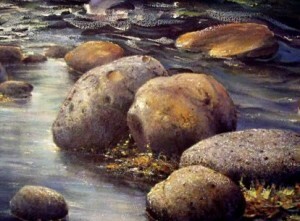 Study water as it rushes over a particular rock and you will perceive three important light effects. Light comes from somewhere. It has a source. Light seems to be absorbed or it passes through or it bounces off a surface. Light is manifested as colour. To bring a real light into your work you will need to have this perception of light as colour and then the necessary skill to interpret this perception with paint colours. Let’s start with #1. “Light comes from some where.” If a light is shining on something we call that illuminating light and it will produce one of three effects depending on the nature of the thing. Once you identify the nature of the thing you will know how to produce the colour effect. Light on a solid thing, a rock, tree building and so on is ‘absorbed ‘ and we call this surface colour. It translates into thicker, possibly more textured paint or what we call paint with body.Depending on the thing and its texture it will produce a shine or glisten or it will reflect light or it could glow like a pearl. All these lighting effects have names but your job is to perceive them and translate them with painted colour. Think of the surface colour effect on a dry piece of grass as compared to the same illumination on a wet rock. Each produces a different light. 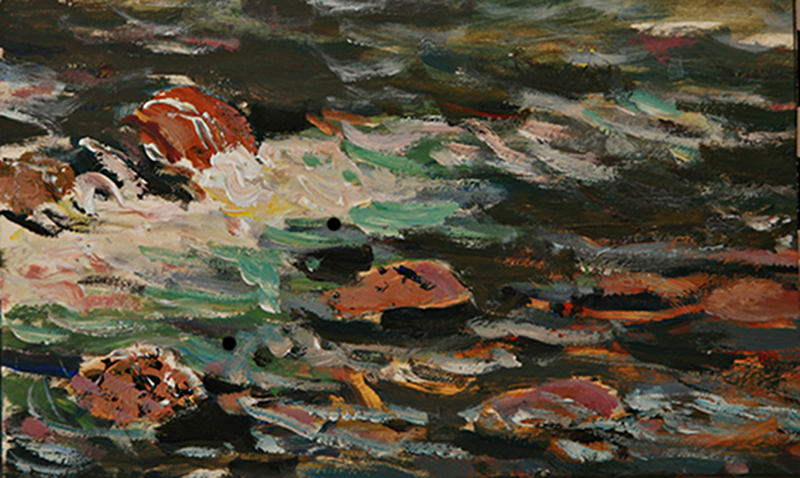 Study the difference and you will realize that each will need a particular handling of paint and attention to colour. The grass and the rock may be the same colour but not the same lighting effect. Light that fills a space such as the sky or a shadow, is called film colour. It doesn’t translate well with thick paint. You can make a sky decorative using thick paint and accentuate its local colour and shape, but you will never capture its light nature unless you see it in it’s film nature. Shadow effects are very similar. To capture them keep the paint filmy with some strong, strong surface paint accents. There are always some mixtures of thick and thin paint in skies and shadows but keep the filmy quality predominant. Mists and fog should be treated as film paint. Use a thin to medium consistency. Think of veiling the paint and keep it semi-transparent. Film colour is always present in a landscape, look for it and translate it into a colour effect. Light that passes through a thing is called volume colour. Liquids are a good example. For the camera, colour is colour but for the artist colour is effect. A glass of red wine appears as red as a red hat to the camera lens but you must recognize that one red is a surface colour and the other is a volume colour. It is in the handling of the paint that will present the light quality of each thing. Study the light, identify the effect and observe the colour. The more you see the more you can eliminate. Get down to the effect and forget about form and composition. After all, these are details of craft not perception. #1 In the morning light concentrate on an object and it’s cast shadow on a wall or the ground. Look into the shadow area with half closed eyes. Forget about everything you know about colour harmony. Empty your critical mind and concentrate deeply on the shadow area. The shadow is Light. Colour manifesting in the shadow surface creating depth and colour. You will start to see a predominant hue infused into the shadow. If the object is blue an orange hue will be perceived in the shadow, its dominance will depend on the hue of the shadow surface. If the surface is of a yellow hue the orange will be quite apparent. If the shadow surface is green the effect will be different. Keep looking into the shadow and not at the object. 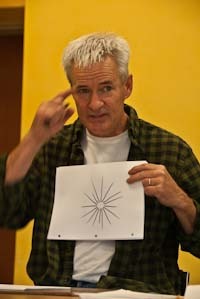 Then dart your eyes back and forth several times from the object to the shadow. Your perception will be heightened and you will come to an experience of coloured light. All the colour theory you can read will never give you the ‘experience’ of colour but once you have this experience your reading will make much more sense. #2 In the evening light, look for that magical light that that makes colour rich and penetrating. Search out a tree or an object that is completely saturated with evening light, but make sure it is fully illuminated with the light source directly in front. The light will be hitting the subject. Observe first what is around the subject. If it’s a tree trunk fully illuminated can you see to either side of the trunk? Do you see any ‘bouncing light’? Half close your eyes and you will perceive light bouncing radiating and vibrating at the edges of the subject. Look and see what else you can discover. If your subject has any surface sheen or shine such as water or an apple in a tree the light dance will be more dramatic. #3 In a shaded light by a source of water focus on the bottom of a creek river lake or even your bathtub if your stuck in the city. As you focus on the bottom you will experience a chromatic light effect. Keep your gaze on one spot on the bottom don’t look at the surface water. After a moment or two focus on the surface water and the whole color effect changes. The surface is reflective and it has shadows wherever the water is moving. Since you can’t focus on two points at the same time you will have to paint two light effects on the same surface, one on top of the other. #4 In the low light of dusk find a quiet space to observe the landscape. As you look out you will remember ‘No light no colour.’This is not entirely correct since there is always some light but this light at dusk is a very low illumination. Light values become darker and dark values become lighter. It is the grey zone. A perfect light to study grey. Look and you will discover that black and white are not a true grey when mixed together. Grey is colour but never a pure colour. Understanding grey is going to be one of your best colour tools. #5 Locking colour effects in your memory is essential and can be developed in a short time. Turner’s memory was so keen that he could bring to memory an effect he experienced years before. You may not be painting hours each day but your eyes are open most days so perceive the colour of light whenever you can. How do I make the colour effects I see with paint? Follow the exercises for one month and start reading this short list of books. Colour Perception In Art by Faber Birren,This book will show you how! Colour Works, the Crafter’s Guide to Colour by Deb Menz. This is a clear concise introduction to colour theory with brilliant examples. Get all those nasty colour words under your belt such as tone shade hue chroma low and major keys and on and on. 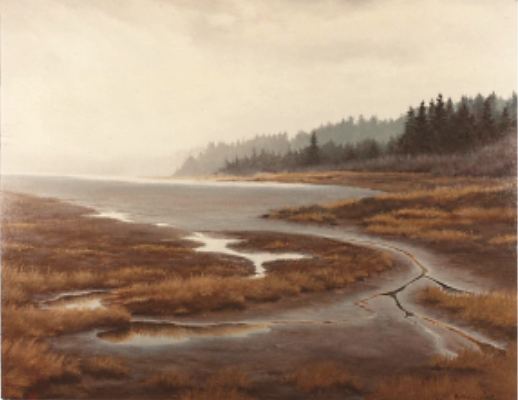 Ron Mulvey is a contemporary landscape artist. You can browse his online art gallery here. Artist’s notes: Dark red rocks. This is a river near my studio. 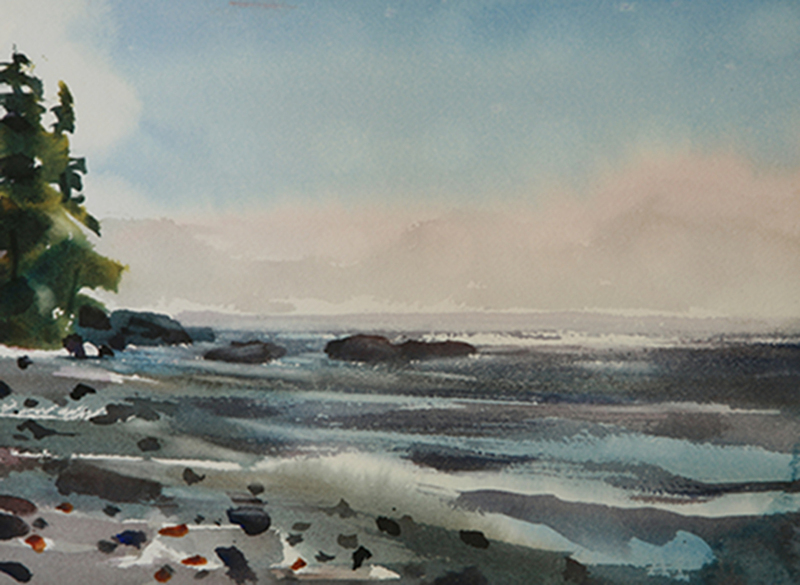 Artist’s note: This is a watercolor of Gonzales Beach in Victoria BC. 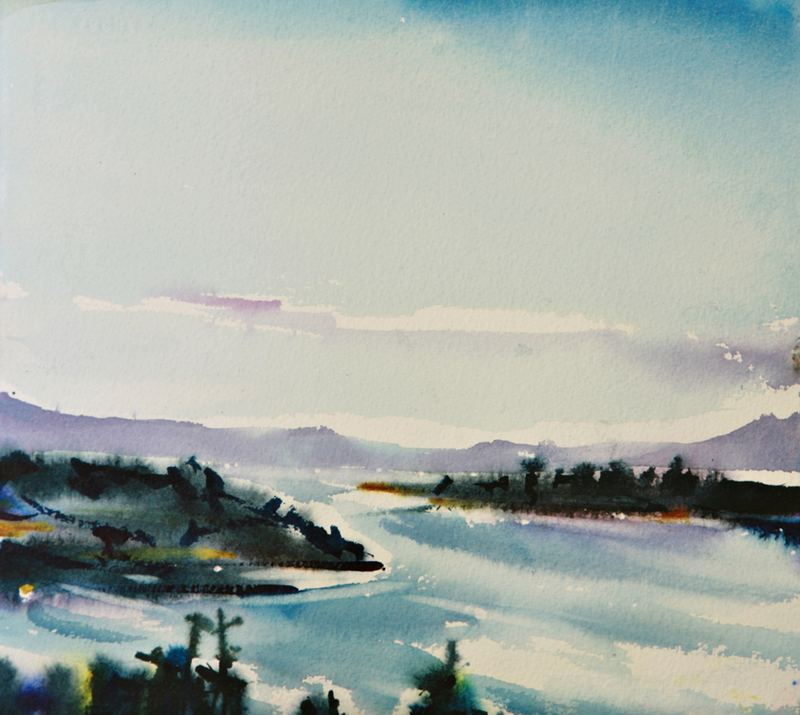 The soft summer colors and warm bay are typical of this bay, a beautiful little piece of Vancouver Island. The painting was done in 2011 and Victorians will recognize the common view from the picnic area of Gonzales. Artist’s notes: This was painted at the top of Mount Doug in Victoria BC, looking down on Vancouver Island. In the distance, there are the ferry terminals. Soft-colors. It was painted near sunset in August, 2011. 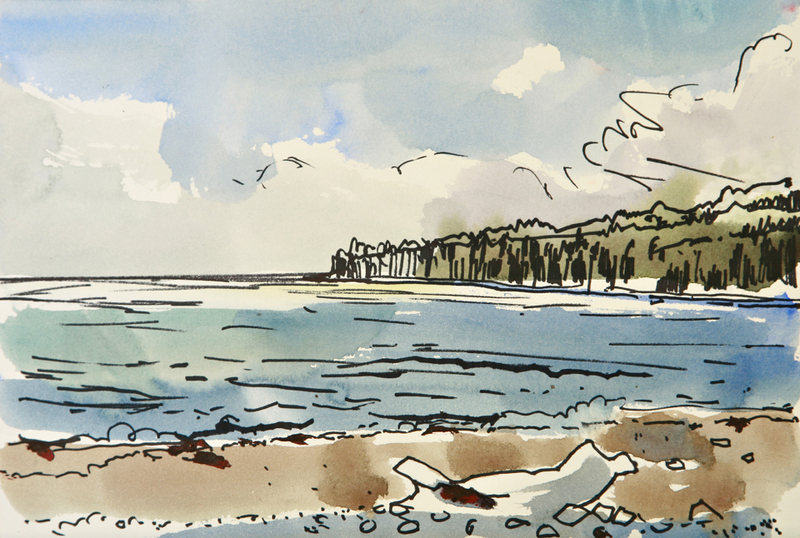 Artist’s notes: This is the iconic Sombrio beach, a famous wilderness beach on Vancouver Island. 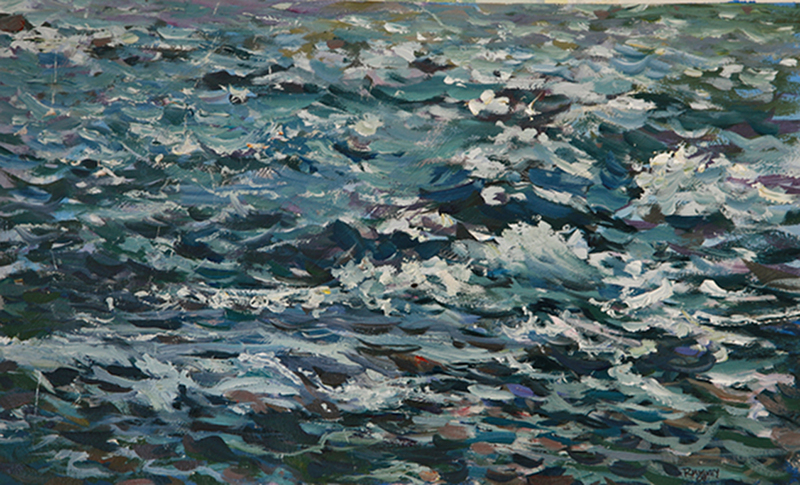 The painting was done on a hot August day with bright blue ocean colors. Those who have been to Sombrio will recognize the coastline–a perfect day on Vancouver Island. Artist’s notes: This is a gem. If you look closely you can see spring board cuts visible on the old cedar stump, meaning that this giant tree was logged by hand. Typically, loggers would cut a wedge out of the stump and insert a board to stand on. Subtle burn marks also show that this stump survived a massive forest fire that swept through the valley. This acrylic painting has bright colors. 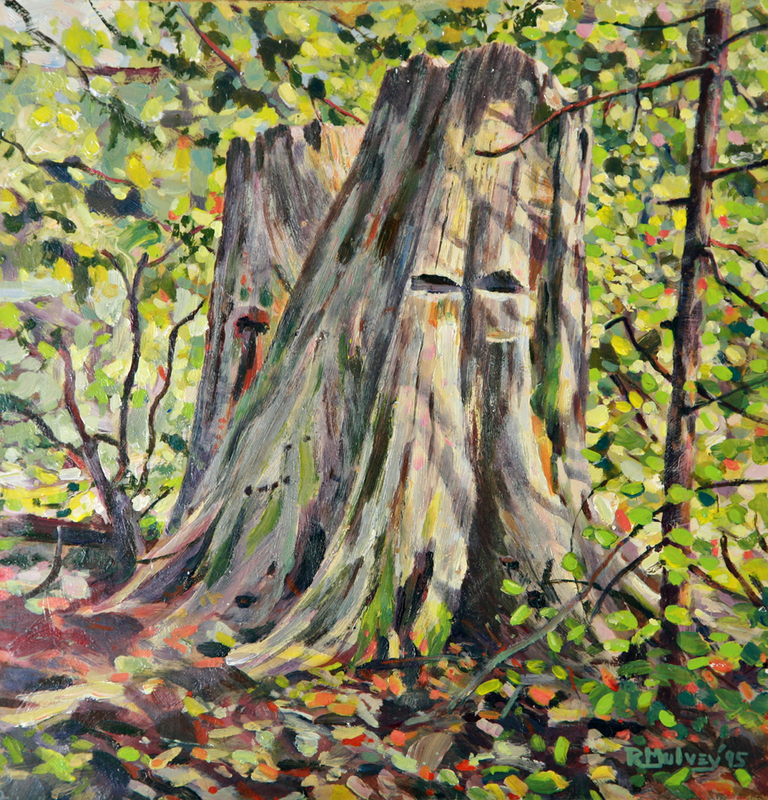 This stump is about 50 feet from my studio near Nelson BC. Painting was completed in 1995. Artist’s Description: Hot summer day in July. 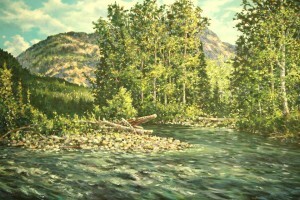 Landscape painting of Airy Creek, a small creek that runs direct down from the famous Frog Peak in the Slocan Valley. This painting is well executed and clean. It was painted in the late 90’s. Artist’s notes: Dark colors, very true to the original scene. 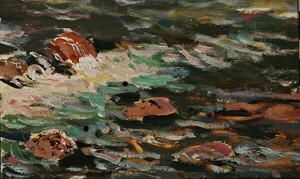 This is a painting of a spring run off. The river is the Little Slocan River–about 45 minutes away from Nelson BC. The painting, if you see it in real life, has a strong, perfect unity. Great pure color accents if you look up close. This scene was painted in the mid 2000’s. 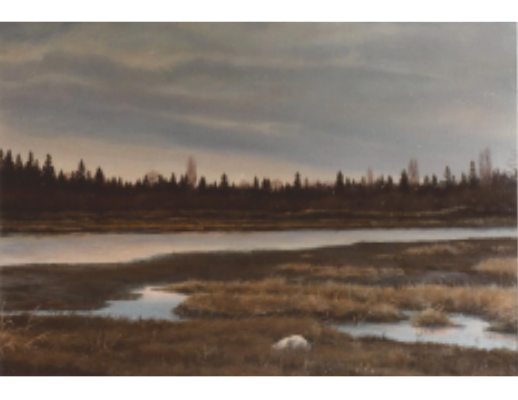 The early 80s brought me some early recognition from two noteworthy people: the magic Realist painter and author Rudy de Renya and Kenneth Heffel, a charismatic and famous Canadian art dealer in Vancouver. After mentoring with de Renya for a year I was advised to seek out the best art gallery in my area and show them my work. Being young and somewhat fearless, I asked around and kept hearing the Heffel name so I made an appointment. The Heffel Gallery was, of course, back then very prestigious. Now, it is considered Canada’s leading fine art gallery (for some amazing Canadian art here’s a link to the Heffel Gallery). I headed down with my wife Sara and five of my best works in our 1967 Ford Falcon. Does not sound like a recipe for success, except for the young and fearless. The Heffel Gallery was definitely upscale. It was a heritage building with all the trimmings: plush leather seats that looked out on the icons of Canadian landscape paintings works by Jackson, Varley, Milne, and Thomson, all of them in quiet rooms or under soft light. The interview began with the sales managers and the five works were brought out for scrutiny. They were very pleased. In the end, three works were consigned to be sold. Then we were introduced to Kenneth Heffel. His heartwarming smile and sincere handshake sealed the deal. 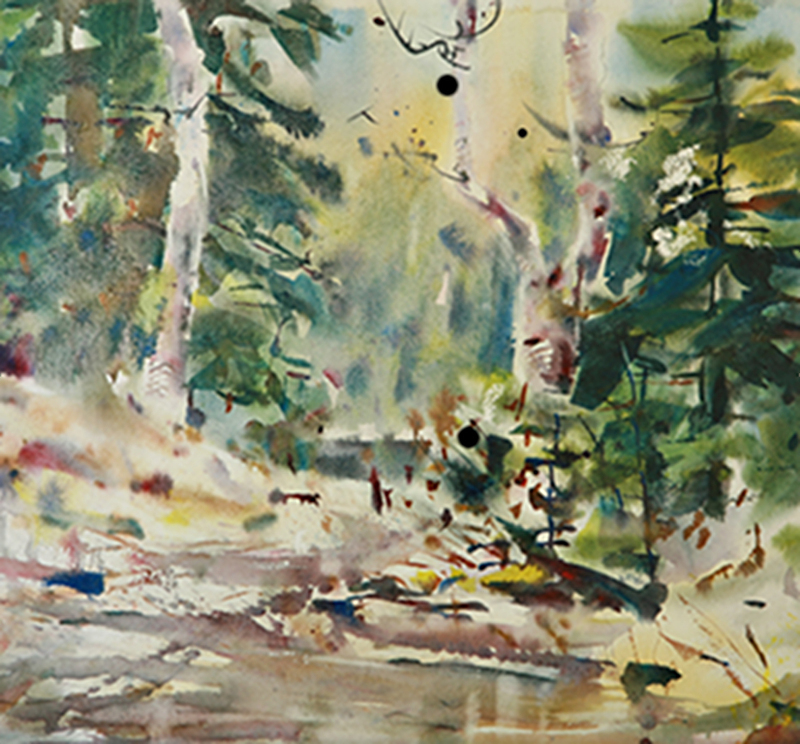 Ron is a contemporary landscape artist. 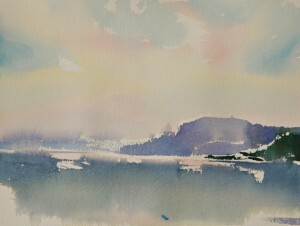 You can view and buy his landscape paintings in his online art gallery. He lives near Nelson BC. Here are 10 common mistakes for artists to avoid. If this is your first time reading my blog, I’m a contemporary landscape artist. You can view my online landscape painting gallery here. The following mistakes are things I’ve learned over the years. #1 Don’t sell all your great work. Invest in yourself and hold on to some of the really good ones. Study the ones you keep and if you are going in the right direction you will discover their magic. I have pictures from thirty years ago and can now appreciate what took place inside the creative spirit that produced them. #2 A little originality trumps the best imitation. Be original–not necessarily different but at least distinctly you. In writing, they call it finding your voice. And this usually means when you stop imitating and begin to show the world your personal perspective on things. Originality is much more powerful than imitation—even if that imitation is highly polished. #3 Don’t dig through the garbage looking for a crust of bread. This has nothing to do about the starving artist thing; it’s about the people and places you try to use to further your career. Exhibiting your work is not a hang anywhere scenario. Be selective and exhibit professionally such as your studio (or home studio) or at a gallery. Restaurants, craft fairs, downtown parks, sidewalks, and the local bakery are usually easy places to show—but they might not be worth the effort. The lighting is dreadful and the clientele are not interested in buying art: they are there to eat, to walk in the park, or buy a coffee at the bakery. The most basic rule of marketing is to fish where the fish are. Exhibit in places where people come to view and buy art. #4 Don’t neglect your natural talent. It is innate and it is yours to nurture. I have a talent painting nature. I really enjoy sitting for 2 or 3 hours painting outdoors. It’s natural for me; I don’t force myself to do it. I feed this talent first and then attend to the rest. Identify your natural ability and develop it. #5 Don’t bury yourself in your ego. A reasonable amount of progress in a reasonable amount of time is a much healthier lifestyle than working on your craft 13 hours a day. Go for the marathon. Painting 15 hours a week (in the evenings, the early mornings) for 50 years is much more productive that working all night one day, and then not touching a brush for a few weeks. Integrate your craft into your daily life. #6 Don’t get stuck in the studio. Get ye to the high mountain and refresh your creative awareness by looking, sketching, enjoying, and appreciating nature. Or, if you are not a landscape artist, go down into the streets, hear people talk, and experience life. It might not knock on your door but it is out there. Read about great artists. Find out their struggles and joys. Look at their work and their contemporaries. Where do you fit? Will anybody read about you? Is that important to you? Why do you do what you do? Introspection helps your work become more original. Study them and grow. #9 Don’t use inferior grade materials. Bronze and stone are permanent. Use permanent materials only. If you can’t afford them then work smaller until you overcome that problem. Art needs to survive. And you will thank yourself later (in 30 years) for buying the better material. Overcome with perseverance and principals. Struggle is learning. It strengthens our weakness. 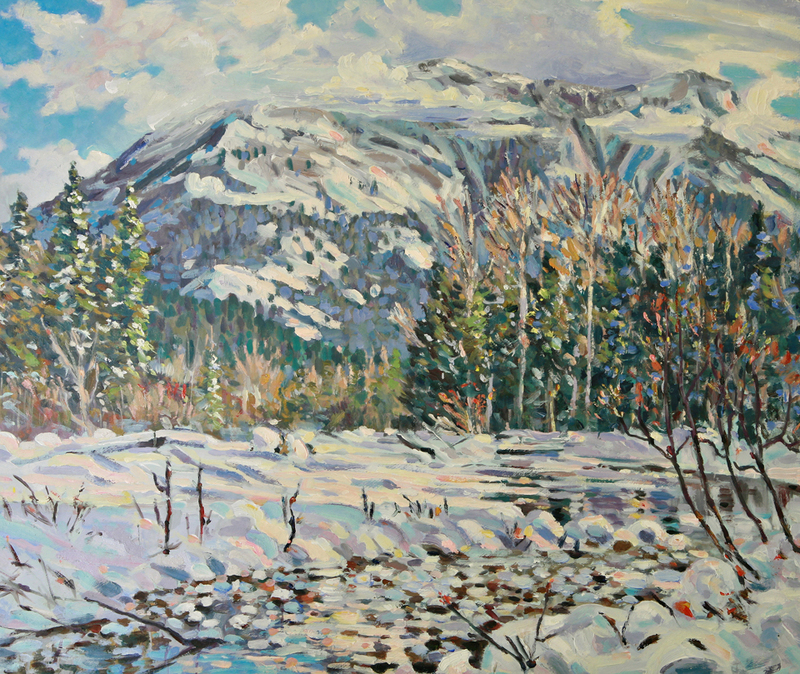 You can view Ron Mulvey’s contemporary landscape paintings here. 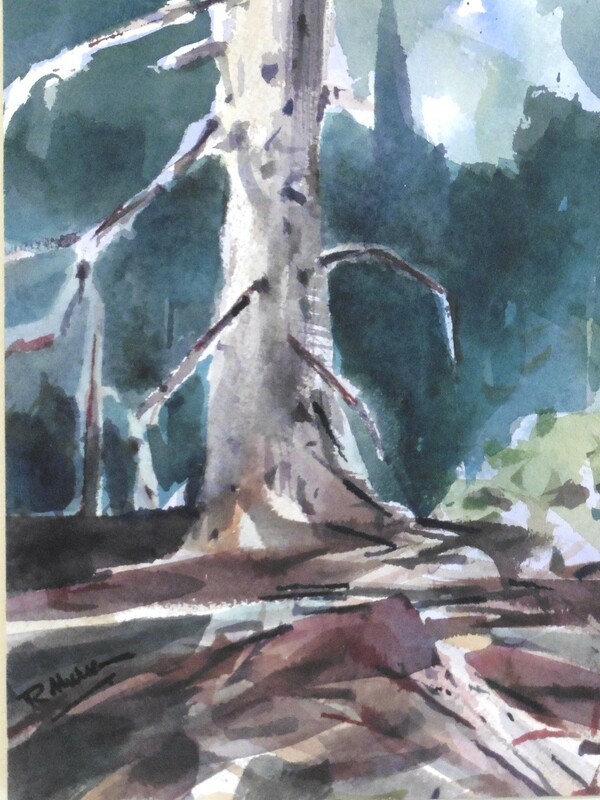 Or take home a small original art work for only $40–ready to view, ship, and be ordered online in Ron’s online store. View and buy inexpensive art online here. Bad experiences buying art online? What is the greatest fear related to buying art online? Sending money to a stranger and getting ripped off? Being disappointed with the true product when it arrives at our door? Not really knowing whether the dimensions will fit our walls or whether the colours will match the rest of our house or office? And then being stuck with a giant picture–wondering if the artist wouldn’t be terribly upset if we asked for our money back? Obviously, artists like myself are biased when it comes to encouraging people to buy art online. But I think the real fear isn’t any of those questions above–the real fear is that we have never done it before. It’s new. For what it is worth, here is an artist’s take on why buying art online is advantageous to both buyers and sellers. Most art galleries know that they need to somehow adopt to the growing amount of artists trying to sell their art on websites–rather than in galleries. And so, they advise buyers to go search out a particular artist online by a gallery and then report back to them to see and possibly purchase that online painting at their gallery. Comissions are added onto the price ranging from 40% to 60% and you walk out with your painting, feeling safe secure and satisfied. Galleries still want to be the centre of the art trade. But in five or ten years, people will simply become more comfortable buying online. For example, I never thought anyone would buy clothes online. You need to try on a sweater or shirt before you buy, right? But online clothes retailers like J Crew are showing that younger generations don’t have the same objections to online shopping as many Baby Boomers. My daughter regularly buys sweaters, blouses, and even boots online. And really, it’s not much different than how we have shopped and purchased with catalogues for the last 100 or so years. In other words, the biggest objection to buying art online is that you won’t like the painting when you receive it in the mail. And, as online retailers know, this is best answered by a strong, fair return policy which puts the extra cost on the seller. People will never buy online if they don’t feel like they have the freedom to change their mind once the product arrives in the mail. And that means that the seller must take on the responsibility of risk and the seller must absorb the costs associated with that return. Artists need to do the same–if the customer isn’t satisfied when the painting arrives, then they should be able to ship it back, get a refund, and pay nothing for the inconvenience. That’s because the worst fear of buying art online is that you are making a large purchase decision. You want to make sure you make the right choice and not buy something you regret. By the seller assuming the risk and offering strong refunds, then it is just a much more pleasant, comfortable experience for the customer. If this were a traditional gallery, you’d never get to see much of the artist. With online sales, artists like me have to prove we are human with blogs. You have to interact with the customers, talk about your own work, and even pick up the phone. I find this very rewarding. Nothing fuels an artist like an audience. And I think that customers appreciate this as well. The web is making the world smaller, not bigger. As most artists aren’t web developers, they rely on 3rd party payment systems like Paypal. These are very secure. It really is no different in terms of risk than giving your credit card to the clerk at the grocery store. With email, you can always get rid of any other objections simply by asking. If you have any questions, please contact me <ron.mulvey@yahoo.ca>. I really will personally respond and back all my paintings with a 90 day full-refund policy. I will also refund you the cost of shipping the art back if you aren’t completely happy with your painting. And then even send you a free little framed sketch for your trouble. Because a happy customer, even if they return a purchase from time to time, is always the best marketing. 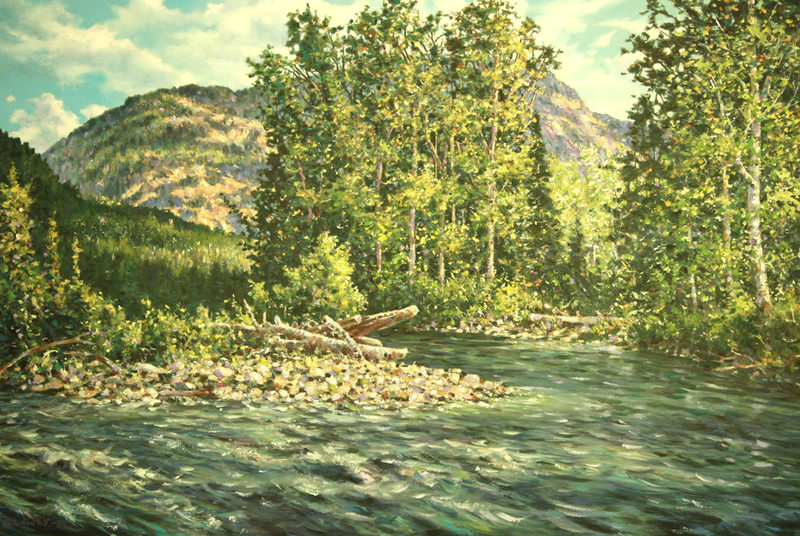 Ron is a contemporary landscape artist. 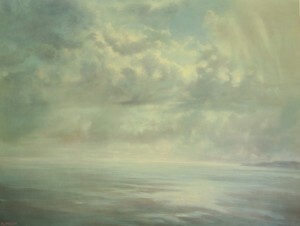 You can view and buy his landscape paintings in his online art gallery. Never bought art online before? Ron offers beautiful, original landscape paintings for just $40. You can view and order these small paintings here. Artist’s notes: This is a tiger rock and was painted in Victoria BC, near Dallas Road. This was a summer painting (in 2011). Calm colors and those who live in Victoria will recognize the rocks and ocean. Moving water is the key element for success. Know your water and know what it can do for your brush. If you ignore the part that water plays you will end up out of control. Labor is also important because if you labor at it you kill the process. The magic of watercolor is found in the immediate response to the wetness of the paper the purity of the color and the deftness of the brush. There is only one mistake you can make and that is to try and control the natural properties of the water. You have to stay in the background at the end of your brush much like the fly fish angler at the end of his rod. The action takes place on the surface of the water away from you and you have to feel and observe–not control and fuss. 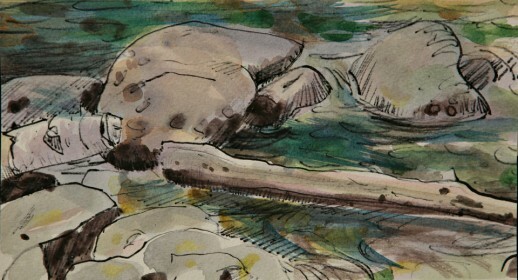 The paper is saturated with water; the brush is charged with pure pigment which is flicked and maneuvered across the receptive surface of the paper. There is no turning back; you are committed. You have 15 to 30 minutes for the image to surface, start drying and be transformed. What it will look like at the end is always a mystery until it has set and dried. 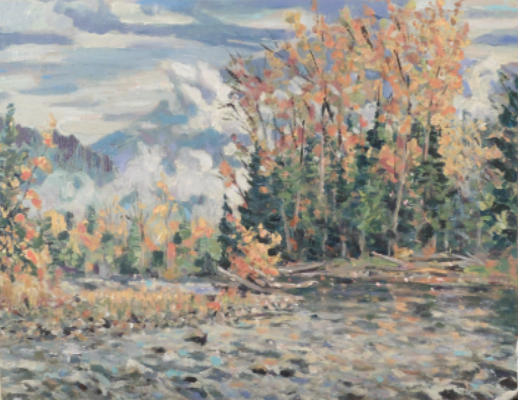 Ron is a contemporary landscape artist. 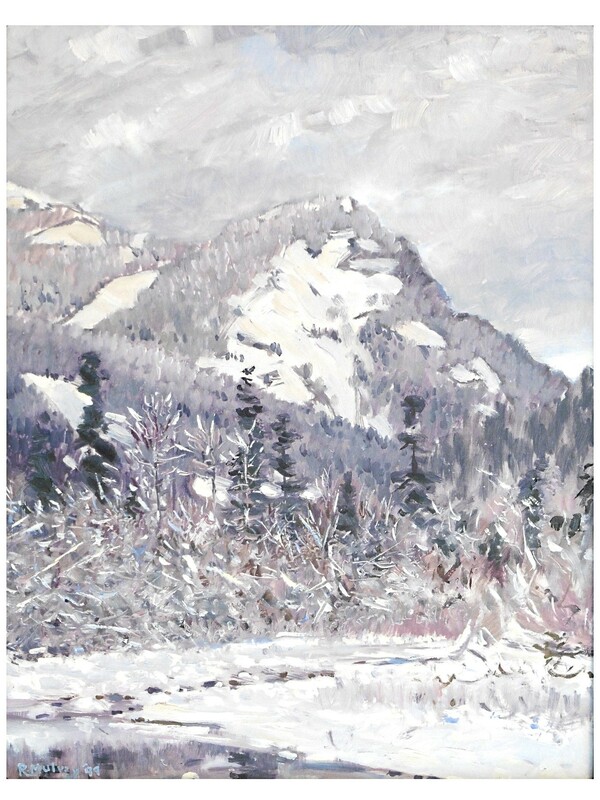 You can view and buy his landscape paintings in his online art gallery. 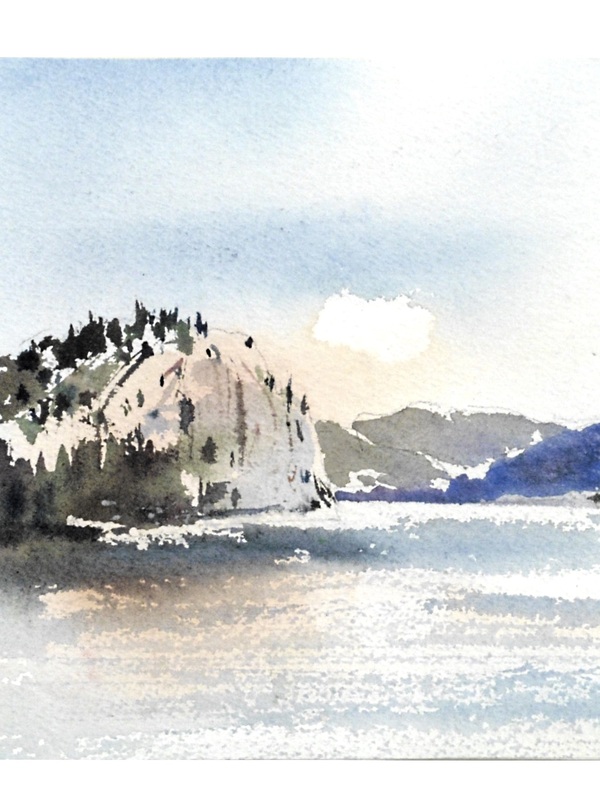 Ron offers beautiful, original landscape paintings for just $40. You can view and order these small paintings here. If the painting surface is smooth (no thick build up of paint), here is how to do a safe cleaning. First, vacuum dust off surface without touching it. Keep the soft brush attachment about 1/4” from the surface. Allow the suction to take up loose dust particles. Gently brush the surface with a very soft-haired brush. Do not scrub. Hold the picture up vertically and flick the brush in a downward motion starting at the top of the picture. The dirt that is loosely attached to the surface will fall to the bottom. Continue this flicking to the bottom of the painting and then vacuum once again. Now that you have removed the surface dust, examine the painting closely. Use a magnifying glass if you can and look for insect stains (flies will leave little brown spots), cracks in the finish, chipped paint layers, food stains, anything of an organic nature. If you find cracks don’t disturb them or apply anything to them. Your job is to clean, not repair. We don’t repair paintings; we restore them. If you wish to restore you need to research. Google ‘oil painting restoration’. Using a ‘Q-Tip’ or cotton swab, look for little specs. A spot will usually be the size of a small freckle; you may have a few or a lot. Choose one and lets see what the cotton swab can do. If it comes off easily, great! If it doesn’t, don’t panic and start rubbing – once again, never scrub. Find the spot and gently twist the swab in one direction 3 or 4 times. Take a look at the swab. If there is dirt, you are on your way. That’s the purpose of cleaning: get the dirt. Now if the spot is still there, get another clean swab (you can not clean with a dirty one). Repeat – Gentle Twirl – Check for Dirt – Repeat. When the swab comes out clean after a twirl, stop. If the spot is still there, leave it. 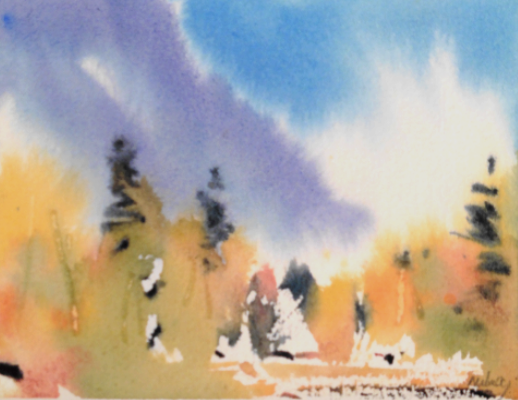 Ron is a contemporary landscape artist. This website is his online art gallery. Looking for an inexpensive piece of art? 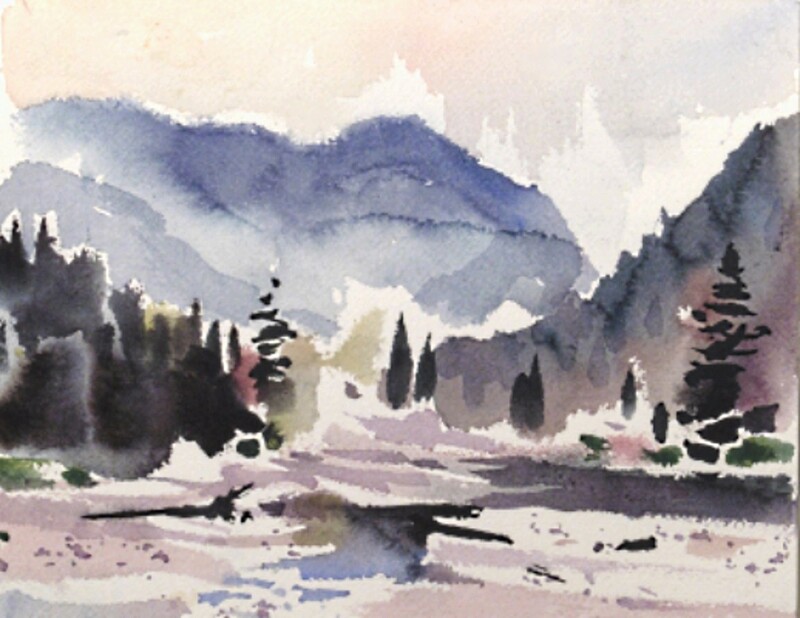 Ron offers beautiful, original landscape paintings for just $40. You can view and order these small paintings here. Here are just some random thoughts on the primary mediums of a landscape artist: oil, acrylic, and watercolour. These aren’t really meant to be read by art collectors. Just me thinking about the daily materials that I use and the best methods for using oil, acrylics, and watercolours. In the studio, as a rule, I work fast with oil initially and then slow down, settle in and enjoy what only oils can do. Each medium has its innate personality: oils should really be layered. They should glow with a luster that says “I am fully saturated with colour, and oil.” There are definite ‘dos and don’ts’ and the success of an oil is knowing the chemistry that produces the glow and finish only oils can produce. I like oil paints because they are slick, full of light, patient (slow drying), adjustable, fully saturated, of two natures; fast and direct, slow and thoughtful. Nothing is as permanent as plastic. Fast drying, easy to build up, thick and juicy if you want, or thin and liquid. Plastic paint that likes to be built up, plastered on, layered, veiled, or mixed with a myriad of extenders and mediums. 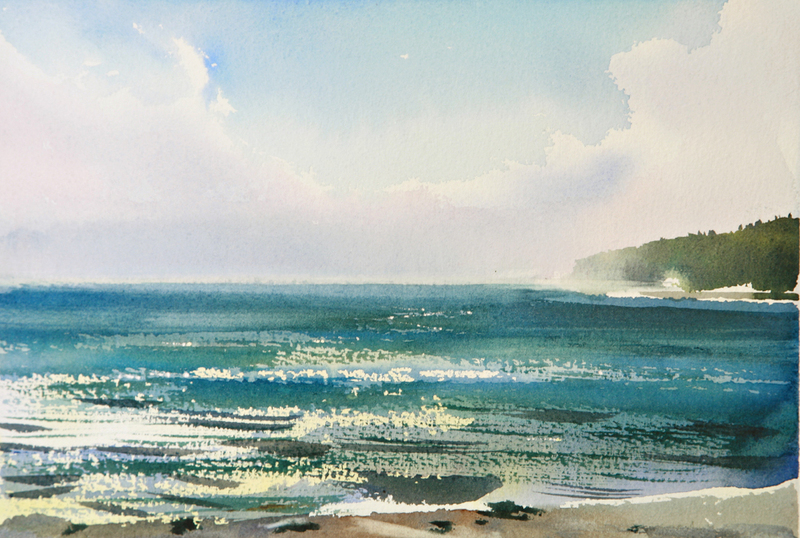 If oil is deep sea fishing and acrylic is trolling then watercolour has to be the intimate friend of flyfishing. Direct, demanding, technical, liberating like winning a lottery when all goes right; but never plodding or time-consuming. 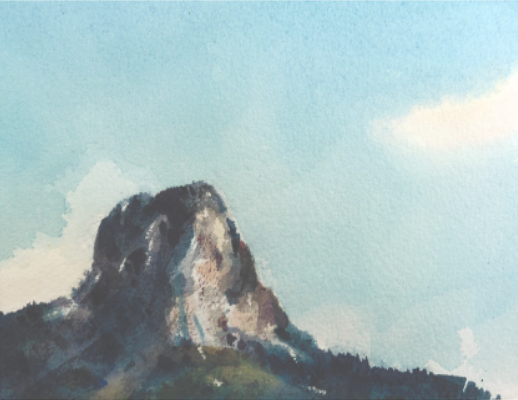 If you spend 50 hours on a watercolour, then 48 of those hours better be spent getting ready. My conviction is it happens and it has to happen quickly. Leave the adjusting, modifying and correcting to oils and acrylics. Waterclolour is about see it, do it, accept it. 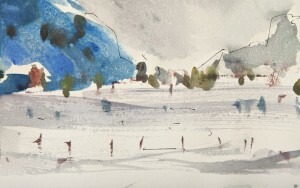 To me, a long drawn out watercolour is like snow shoeing down a ski hill: you’ve got the wrong equipment. What’s the best lighting for displaying art? The real trick for displaying your art is to find a light that complements the light in your painting. Low chroma paintings (dark intense, somber) do not require much light. The contemporary landscape artist has designed the low chroma painting to bring out the dark colors and so to display it in bright light is to ruin the overall effect. The opposite is true for bright and colorful pictures. They have been designed to be full of light–and so, they require more light than a dark, intense picture. In other words, remember that artists work with light–your lighting, then, should work to compliment the painting. It is a personal preference of mine to look at my low chroma pictures (dark, somber) later at night with a small amount of indirect light or a soft spotlight and enjoy the deep saturated colors as they create a mood in the picture that is not so evident during the bright daylight. A high chroma (bright, colourful) picture responds well to a higher light level in most cases and may work well in brightening up a wall space that is in a darker part of a room. If you want to prove conclusively the worst lighting possible for a work of fine art take it outside at noon into the bright sunlight. It will appear washed out and garish. This is your real starting point: it is the worst light; even the Mona Lisa wouldn’t stand up to this test. What’s the correct viewing distance for displaying paintings? To observe a work of fine art properly as the artist did when creating it multiply the dimension at the bottom of the picture by 6. If the bottom is 24 inches you should stand back 6×24 or if my math is correct-12 feet which is roughly 4 regular steps back from the picture. Rembrandt’s Impasto method was not appreciated by the critics because their viewing distance was much too close. Rembrandt’s genius can only be appreciated when the eye mixes the color at the proper viewing distance. Up close it looks coarse. The smooth flawless realistic painting demands our scrutiny up close–so don’t hide it up out of reach of your nose. Instead, place it in an intimate corner and allow viewers enough space to inspect it at several different viewing distances. In contrast, a big bold abstract needs a buffer of air with lots of viewing distance. Don’t give much opportunity for the viewer to get up close. With abstract art, the effect is appreciated from a distance and there is not much reason going on up close for the viewer to see. The last lighting effect to consider is the reflected light that is caused by artwork under glass and high to medium gloss finishes on canvas or panel board. The glass protects the art work from insects, finger prints, sneezes and so on. The gloss or semi gloss finish on canvass and panel board effectively accomplishes the same function as glass: both can be very annoying when it comes to lighting the painting. The surface glare can be minimized by not having a light source directly opposite the work such as a window or lights. Direct light creates glare. The use of non glare glass is not advisable as it obscures the picture image and increases ultra violet damage. There are finishes for oil and acrylic paintings that produce an eggshell finish that has little or no glare. The old idea of putting a shiny finish on artwork should be stopped. It is not necessary since paint science is at the cutting edge of technology every stoke of the way. The shiny finish is used to enhance the colors and at times to cover up poor painting techniques where colors have sunk in or lost there lustre. A well painted oil needs very little shine on top the natural oil mediums produce a wonderful sheen that needs only a very thin protective varnish. Some artists will not object to putting a light top coat of U.V.protective spray to take down the glaring high gloss reflective finish. All finishes are designed to be removed easily but don’t do it yourself (out of respect for the artist). Finally, halogen lights are the choice of the PhD’s in lighting science next to indirect natural light in combination with the halogens or incandescent. Fortunately, art is the only profession in which no one considers you ridiculous if you earn no money. Nothing fuels an artist more than sales. 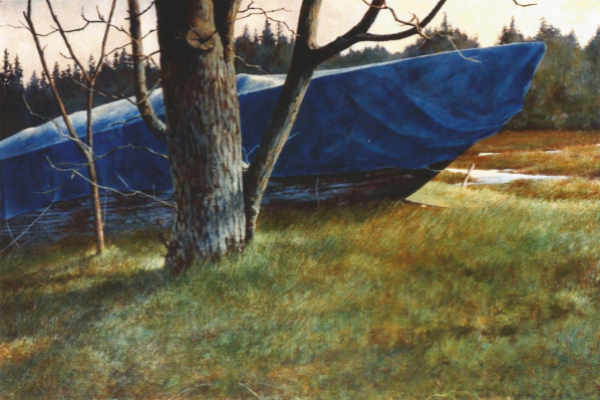 In the 1980’s, there were at least four regular clients who purchased many of my studio works in oil and acrylic. They came to every show and their genuine interest and enthusiasm worked like a tonic. While no landscape painter in his right mind goes into art for the money, selling your paintings does give you a boost of confidence and enables you to keep painting. Last year, one very serious collector purchased thirty works from me which included paintings from three decades. There was a point when he had almost the same number as I had. That was one of the most productive years I have ever had. Artists are always very encouraged by collectors; the collector believes in you and believes in the work you are doing. 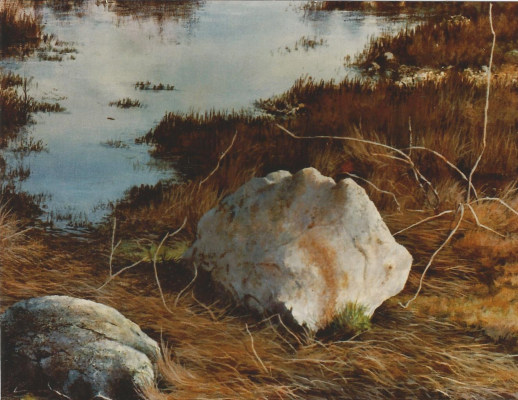 Below is a video of Don Flood, a contemporary art collector who has purchased thirty of my landscape paintings. I am grateful for his support. You can view the video below and see his large collection of contemporary art. If you are near Nelson BC and are looking to buy some art, our Riverstone gallery has just opened. 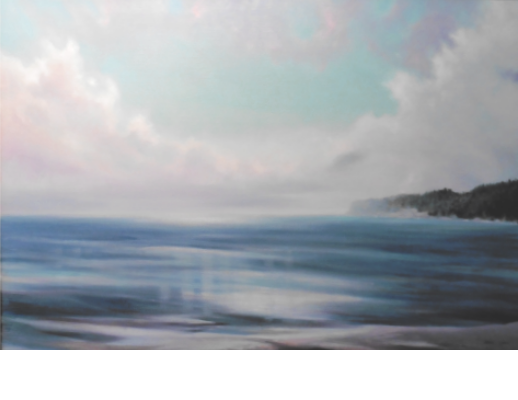 This gallery is a private collection of my contemporary landscape paintings. We are small–but you can come for some organic coffee, juice, or a glass of wine and browse my collection of oils, watercolors, and acrylics. We are open through the week–but it is best to give us a quick call before you come–250-226-7881. 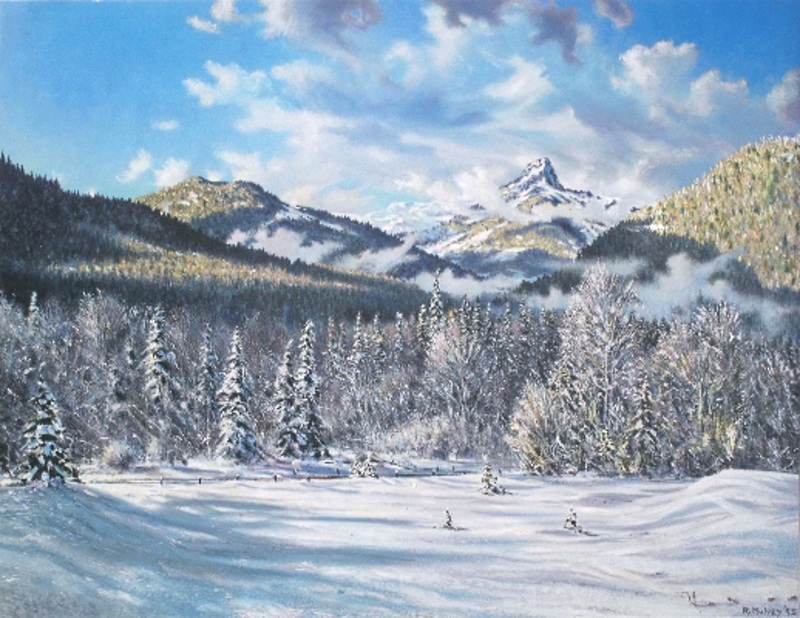 Located in the beautiful Slocan Valley, the Riverstone gallery holds about 15-20 of my favorite oil, acrylic, and watercolors. 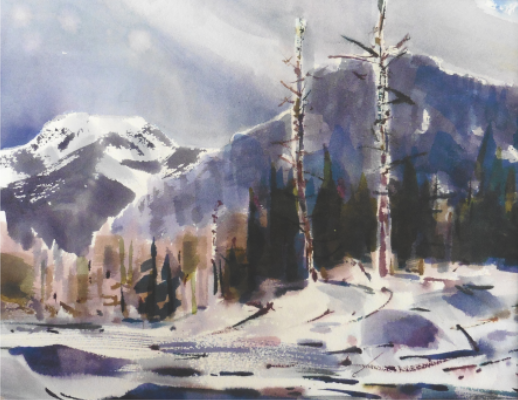 Most of these works were sketched just 200 feet from the gallery–up and down the Slocan River which runs through our property. 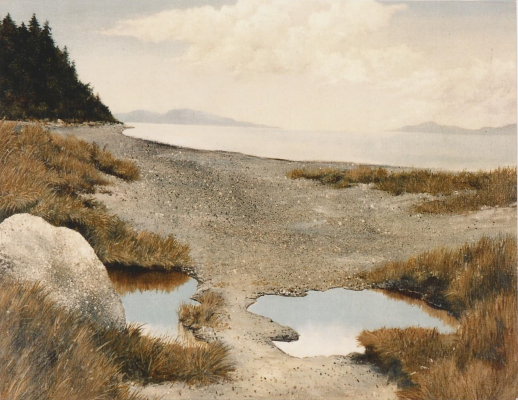 There are also coastal paintings (from Vancouver and WhiteRock), forest oil paintings, and small sketches for sale for only $40. 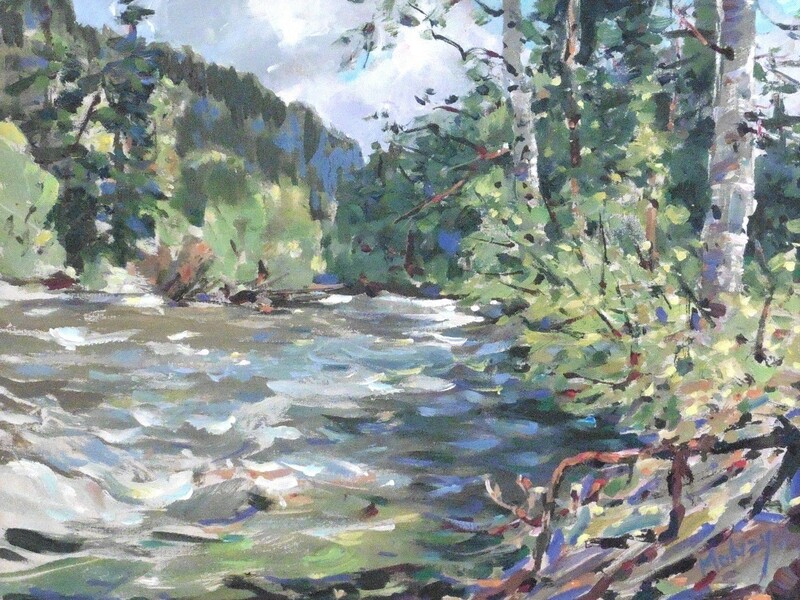 Some of these oil paintings have taken me years to complete; others 30 minute sketches from around the valley and the Nelson BC area. My works have been exhibited before in galleries around BC. But I’ve found it much nicer to have a private gallery and so while our art gallery is located about 35 minutes from Nelson, the drive is relaxing and we have some snacks and refreshments ready for you. Children are always welcome. If you are starting in Nelson BC, here’s how to get to our art gallery. You will go about 21.0 km. Ocean, sky, and tidal pools. Painted in the late summer with Acrylic on canvas. A lone boulder rendered in high realism holds the viewer and forces their return over and over as the eye travels through this West Coast landscape. Classical restraint in color avoids any color crashes that would jar the viewer and hold them captive. This picture is of the magic realist school which takes the everyday and infuses it with texture, mood, and craftsmanship. There is no trace of bravado. Features West Coast gray and blue color. 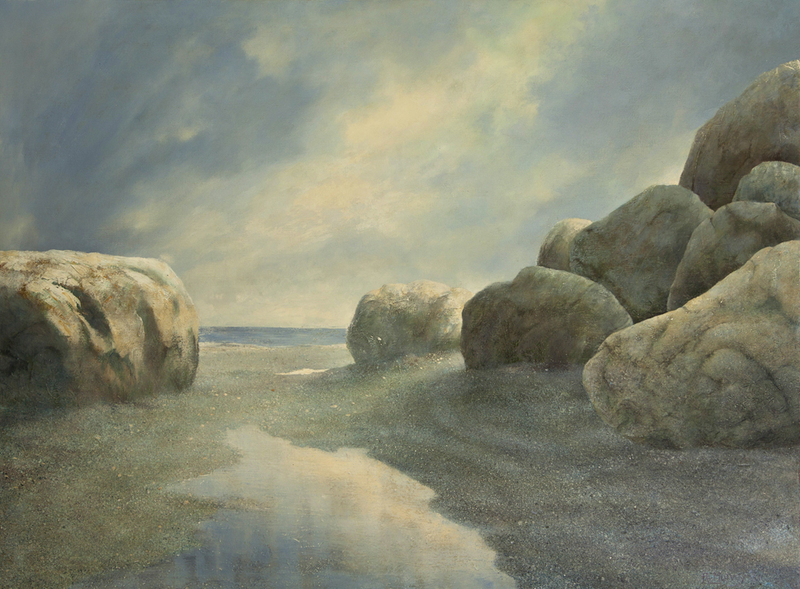 Ron will begin posting some articles about his landscape art, how to clean oil paintings, framing and lighting for artwork, and proper care and cleaning for your oil paintings. First post will be up within 2 weeks.